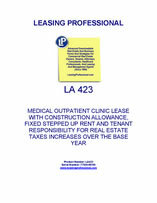 This lease form is designed for a single tenant medical outpatient facility operation. The tenant receives a construction allowance, and the rent is fixed and stepped up over the term (and any renewals) with specified increases. The tenant is responsible for any increases in real estate taxes over those allocable to the base year. This Lease (“Lease”) is made as of _________________, by and between COMMERCIAL PROPERTY LANDLORD, INC., a __________________ corporation (“Landlord”), and AGREEABLE TENANT, INC., a _________________ corporation (“Tenant”). Landlord does hereby demise and let unto Tenant, and Tenant does hereby hire and lease from Landlord, for the "Term" (as hereinafter defined) and upon the conditions and covenants set forth herein, all that certain piece or parcel of land (hereinafter called the "Land"), which Land is more particularly described on Exhibit "A" attached hereto and by this reference made a part hereof, together with a building constructed thereon containing approximately ___________ rentable square feet (hereinafter called the "Building"), situated at _____________________, (the Land, the Building and all of such improvements to be constructed thereto and therein are hereinafter collectively called the "Premises"). 2.1 Commencement of Term. The original term of this Lease ("Original Term") shall commence seven days after Landlord totally vacates the Premises, but in no event later than _______________ (such date of commencement of the Original Term is herein called the "Commencement Date"). 2.2 Duration of Term. The Original Term of this Lease shall end at 11:59 p.m. eastern standard time on the day immediately preceding the day which is the third (3rd) anniversary of the Commencement Date (said Original Term, as it may be extended, as contemplated in subparagraph 2.5 below, is herein called the "Term"). (a) The plans and specifications of all improvements to be made within or to the Building, are herein called "Construction Specifications." An outline of the Construction Specifications will be provided to Landlord upon completion thereof. (b) The term "Tenant's Work" shall mean the construction of the improvements described in the Construction Specifications. "Tenant's Work" shall also include connection of the Building to the public sewer system, which shall be conducted at Tenant's sole cost and expense. (c) Tenant shall diligently, at Tenant's sole cost and expense, perform and complete the Tenant's Work. Tenant's Work may not commence at the Premises until the Commencement Date, provided, however, Tenant may connect the sewer line and all the necessary work related thereto upon execution of this Lease; provided, Tenant shall give Landlord notice, and such Tenant's Work is not unreasonably disruptive of Landlord's operations. (d) All of Tenant's Work shall be done in a good and workmanlike manner and in compliance with all applicable laws and ordinances, regulations and orders of the federal, state, county or other governmental authorities having jurisdiction thereof. (e) Tenant shall have the right to make changes ("Changes") in writing to the Construction Specifications during the course of the construction of Tenant's Work, and such Changes shall be incorporated in the Construction Specifications, and the Changes do not affect the exterior or structural portions of the Building; provided the Changes are approved by Landlord, which approval Landlord agrees not unreasonably to withhold or delay. (f) Landlord and Tenant agree that the Landlord has no responsibility for the construction of Tenant's Work. (g) Tenant shall require any contractor performing work on the Premises to carry contractor's liability coverage, broad form property damage endorsement, and contractor's protective liability coverage. 2.4 Landlord's Contribution. Upon written notice from Tenant, Landlord shall pay tenant the sum of $__________ toward completion of the Premises, and other than as provided in this Lease, Landlord shall have no other responsibility for Construction Specifications. 2.5 Renewal. Provided that Tenant at the time of the exercise of the option herein granted is not in default in any material respect of any term, covenant, condition or agreement provided for in this Lease and if any notice of default has been given, a cure has been completed or otherwise commenced within any applicable grace period, Tenant shall have the right to extend the Original Term of this Lease for two (2) successive additional periods of five (5) years each (individually and collectively the "Renewal Term"). The option for the Renewal Term shall be exercised by Tenant by written notice given to Landlord not less than six months prior to the end of the Original Term or then Renewal Term, as the case may be. Subject to the terms of Section 3.3 below, all of the terms and provisions of this Lease shall be applicable to the Renewal Term. In addition to the Minimum Rent shall be a $___ per square foot charge, or an aggregate of $___ per year, toward the Landlord's insurance as required under Section 5.4. Minimum Rent shall be payable in advance, without demand and without abatement, reduction, set-off or deduction, on the first day of each calendar month during the Original Term of this Lease, allowing ten (10) day check processing time. If the Commencement Date of the Original Term shall fall on a day other than the first day of a calendar month, the Minimum Rent shall be apportioned pro rata, on a per diem basis for the period between such Commencement Date and the first day of the following calendar month and such apportioned sum shall be paid on the Commencement Date. In the event Minimum Rent or any other amount due Landlord hereunder are not paid when due, there is automatically imposed a late charge (which shall be paid by Tenant to Landlord contemporaneously with said payment of Minimum Rent or other amount due) in the amount of the product of four percent (4%) multiplied by the amount otherwise due. 3.2. Commitment Deposit. Simultaneously with the execution of the Lese Agreement, Tenant has deposited with Landlord a sum equal to one month's Minimum Rent (the "Commitment Deposit"). Said Commitment Deposit shall be retained by the Landlord and applied to the first monthly installment of Rent coming due hereunder. In the event that the Original Term does not commence due to the failure on the part of the Tenant, Landlord shall be entitled to retain the Commitment Deposit and pursue all other legal rights and equitable remedies against the Tenant. In the event that the Original Term does not commence due to the failure on the part of the Landlord, Landlord shall promptly refund the Commitment Deposit to the Tenant and Tenant may pursue all other legal rights and equitable remedies against the Landlord. 4.1 Payment. In addition to the Minimum Rent referred to above, Tenant, throughout the Term of this Lease, shall pay to Landlord, as additional rent hereunder, the amount by which levies, taxes (including payments required to be made in lieu of taxes) or assessments (collectively, the "Impositions") imposed, assessed or charged on or with respect to the Premises by any federal, state, municipal or other governmental authority having control and jurisdiction over the Premises ("Governmental Authority") or under any law, ordinance, or regulation of any Governmental Authority ("Law") assessed during the Term are in excess of the Impositions paid by the Landlord for the calendar year _______, which Impositions and documentation relating thereto shall be provided to Tenant. Notwithstanding the foregoing, if any Imposition shall be created, levied, assessed, adjudged, imposed, charged or become a lien with respect to a period of time which commences before or ends after the commencement and expiration dates, respectively, of the Term of this Lease (other than an expiration of the Term, of this Lease by reason of breach of any of the terms hereof by Tenant), then Tenant shall only be required to pay that proportion of such increase in the Imposition which is equal to the proportion of said period which falls within the Term of this Lease. Landlord agrees to deliver to Tenant copies of all such notices of Impositions which Landlord receives during the Lease Term. (b) a policy of Combined Single Limit Bodily Injury and Property Damage Insurance which shall provide protection in the amount of Three Million Dollars ($3,000,000.00) and an aggregate of Five Million Dollars ($5,000,000,000.00) combined single limit, insuring Tenant against any and all liability arising out of Tenant's use and occupancy of the Premises. Coverage shall include independent contractor liability, personal injury, and Tenant's personal property. 5.2 Insured Parties. The policies of insurance described in subsection 5.1 above shall name Tenant and Landlord (and at the request of Landlord, a lender loss payable endorsement) as insured parties. The policies of insurance described in subsection 5.1(b) above shall name Landlord as an insured party. 5.3 Insurers; Replacement. The insurance required by this Section 5 may be maintained by separate policies or by blanket policies. The provisions of such policies applicable to the Premises shall provide that the insurer may not cancel, reduce or materially change any such policies without endeavoring at least thirty (30) days prior to such cancellation, reduction or material change to provide written notice to Landlord and shall be issued by an insurer of nationally recognized financial responsibility authorized to do business in the state in which the Premises are located, legally qualified to issue the same, and subject to the reasonable satisfaction of Landlord. At least thirty (30) days prior to the Commencement Date of the Term of this Lease (or other date by which such insurance is required to be procured) each policy or a certificate thereof required to be maintained by this Section 5 shall be delivered by Tenant to Landlord. At least thirty (30) days before any policy shall expire, Tenant shall deliver to Landlord and a replacement policy or certificate and at least thirty (30) days after the date that the premium on any policy shall become due and payable, Landlord shall be furnished with satisfactory evidence of its payment. 5.4 Landlord. Landlord shall obtain and maintain insurance on the Premises, primarily a policy of Combined Single Limit Bodily Injury and Property Damage Insurance insuring against any liability arising out of the ownership or maintenance of the Building in an amount not less than combined single limit of One Million ($1,000,000) Dollars. Landlord should also obtain and maintain a policy or policies of insurance covering loss or damage to the Premises, providing protection against all perils included within the classification of fire, extended coverage, vandalism, malicious mischief, flood (in the event such is required by a lender having a lien on the Premises), of not less than the replacement cost of the Premises, and special extended perils ("all risk" as such term is used in the insurance industry). 5.5 Other Insurance Obtained by Tenant. Tenant shall not take out or carry separate insurance concurrent in form or contributing in the event of loss with that required to be furnished by Tenant hereunder or increase the amounts of any then existing insurance by securing an additional policy or additional policies, without including Landlord as named insureds, with loss payable as in this Lease provided. Tenant shall immediately notify Landlord whenever any such separate insurance is obtained and shall deliver to Landlord the policies or duplicate policies evidencing the same. 5.6 Waiver of Subrogation; Rights Under Insurance Policies. Each of the parties hereto hereby releases the other, to the extent of each party's insurance coverage, from any and all liability for any loss or damage against such party even if such loss or damage shall be brought about by the fault or negligence of the other party, its agents or employees; provided, however, that this release shall be effective (i) only with respect to loss or damage occurring during such time as the appropriate policy of insurance shall contain a clause to the effect that this release shall either not be invalidated by such waiver of subrogation or not affect said policy or the right of the insured to recover thereunder, (ii) only to the extent of the actual coverage afforded such party, and (iii) only if it does not have the effect of invalidating any insurance coverage required or permitted in this Lease. If any policy does not permit such a release, and if the party to benefit therefrom requests that such a waiver be obtained, the other party agrees to obtain an endorsement to its insurance policies permitting such waiver of subrogation if it is available. If an additional premium is charged for such waiver, the party benefiting therefrom, if it desires to have the waiver, agrees to pay to the other the amount of such additional premium promptly upon being billed therefore. 5.7 Insurance Companies. All required insurance shall be placed with companies rated no less than "A," Class VII in the current Best's Guide. Tenant shall have the right to install in the Premises trade fixtures required by Tenant or used by it in its business and, if installed by Tenant, Tenant shall remove any or all such trade fixtures upon termination of this Lease, unless otherwise requested by Landlord; provided, however, that Tenant shall repair and restore any damage or injury to the Premises caused by the installation and/or removal of any such trade fixtures. Trade fixtures include, among others, medical equipment and related systems, water systems and other equipment necessary for Tenant to perform its operations and business; and none of such trade fixtures shall be deemed property attached or affixed to the Premises or realty.